One of the top newspapers in California published an editorial Wednesday calling for House Minority Leader Nancy Pelosi (D., Calif.) to announce immediately that she will not seek the speakership following the midterms in November. The Sacramento Bee editorial board said the Republican Party is clearly the party of President Donald Trump and the Democratic party can't be seen as the party of Pelosi and still win in November. The editorial went on to say that the San Francisco Democrat's decision to seek the speakership if Democrats take back the House has become a distracting campaign issues, noting Democrats need to gain at least 23 seats. 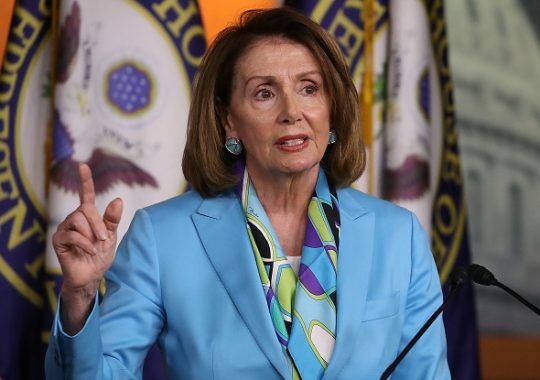 The editorial pointed out that 45 Democratic nominees, including Rep. Devin Nunes' (R., Calif.), Democratic opponent Andrew Janz, and ten incumbents, including Rep. Linda Sanchez (D., Calif.), have publicly said they will not support Pelosi for speaker. While Republicans have been castigating Pelosi for years in campaign ads, she has also been a frequent target of Trump in recent months. "Democrats, please do not distance yourselves from Nancy Pelosi…She is trying very hard & has every right to take down the Democrat Party if she has veered too far left!" Trump tweeted last week. On the other hand, Pelosi isn’t doing herself any favors by playing the victim. Asked during a Sunday interview about Democrats opposing her for speaker, she accused MSNBC of being on a "jag" against her. Better than most, she ought to know that’s getting precariously close to Trump calling any critical coverage "fake news." Pelosi says that while no one is indispensable, she is still the best person for the job. On Monday, her press office sent out a column in which Paul Krugman of The New York Times praised Pelosi as "by far the greatest speaker of modern times," and questioned why she gets so little credit from the media for her accomplishments, which include the Affordable Care Act, and the stimulus package and financial reforms after Wall Street’s meltdown. If you’ll recall, similar statements were made about the eminently qualified Hillary Clinton – and we know how that turned out. Pelosi and other party leaders are trying to get the message out that not only will Democrats oppose Trump and his culture of "corruption, cronyism and incompetence," they are "for the people" and will push for better health care and more jobs. But the political reality is that she is not the most effective messenger. The editorial cited a new CNN poll saying only 34 percent of voters believe Pelosi will be an extremely or very important factor in their decision during the November midterms, but it said that number will increase as election day gets closer and attack ads proliferate. Pelosi became the first female speaker of the House in 2007 after Democrats won a majority in the 2006 midterm elections. However, she lost the post in 2011 to former Speaker of the House John Boehner (R., Ohio) after the Republicans took control of the House in 2010. "But if she truly believes what she says about how important it is for Democrats to retake the House so they can stop Trump, she must accept that it can’t be with her as speaker," the editorial concluded. This entry was posted in Politics and tagged 2018 Election, California, Nancy Pelosi, President Trump. Bookmark the permalink.